Some heroes aren’t measured by their great strength or incredible skills, but instead by their big hearts and acts of kindness. Ten local hunger-fighting heroes are featured on the front panel of a limited-edition Cheerios box which will be on shelves this spring exclusively at ShopRite stores. The box was unveiled in a special ceremony at the ShopRite of New London on Wednesday, April 22, honoring local hero, Bill Pere, Mystic. 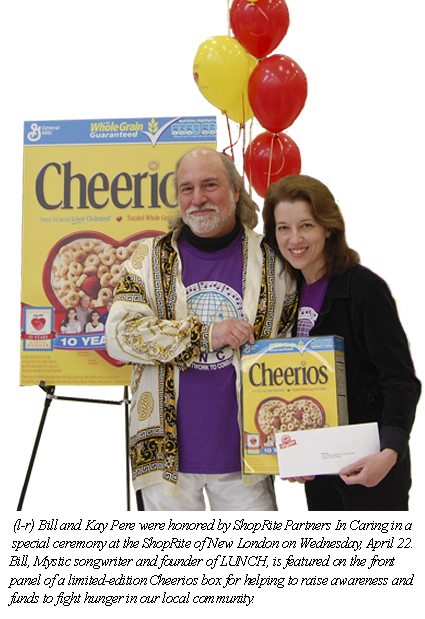 In marking the anniversary of the program, ShopRite teamed up with General Mills in a “10 Years – 10 Heroes” contest, a search for ten local heroes – five children and five adults - who actively engage in the fight against hunger. During the ceremony, Bill received a poster version of the box and 1,000 Box Tops for Education. Bill’s wife, Kay, was presented with a $500 donation to the LUNCH organization.